Thanks to Tomoson.com, I am able to bring you this amazing review and giveaway of the Kakadu Pet Explorer Nylon Fleece jacket. I love dressing up my dogs. It's hard though, because normally the sizes that are available are too small. Well, not with Kakadu. You can find all different sizes; Even XL! I think Wilbur looks so cute in his Fleece Jacket. Not only does he look cute, but I'm sure he's comfortable too. The inside of the Nylon Fleece Jacket is so soft. Not kidding, if they had the jacket in my size, I would even wear it. Today was the perfect day for Wilbur to wear his coat. I know you guys wouldn't think it was cold, but today it was down to about 55-60 degrees, and to us, thats freezing. Not only was it cold out, but it was also raining. 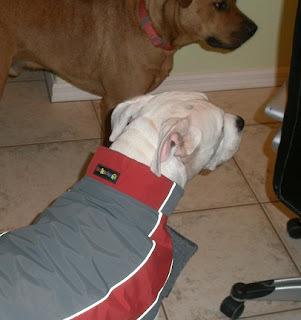 I put Wilbur in his nylon fleece jacket to keep him warm and dry, and it worked. Wilbur was all dry (well except his head, it got a little wet.) Thanks to the Kakadu Nylon Fleece jacket I no longer have to worry as much about Wilbur getting a cold. 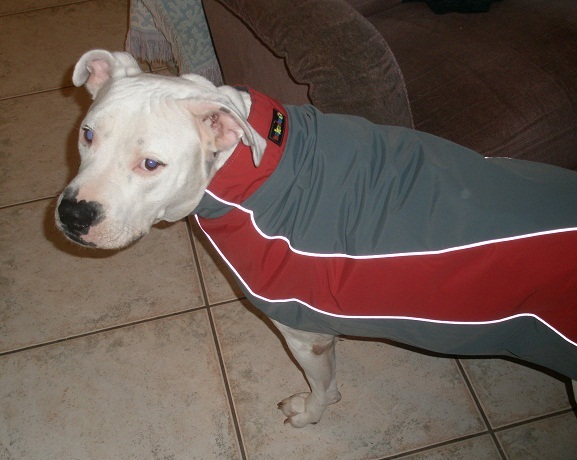 I love the Kakadu Pet Explorer Nylon Fleece. It is great! 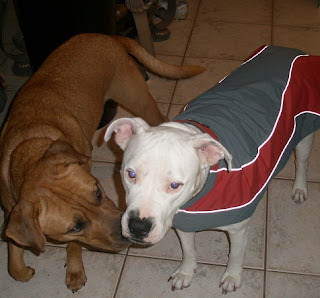 If you are looking for high quality dog clothes, then I really recommend checking out the Kakadu Pet selection. 1 of you will receive a Kakadu Pet Explorer Nylon Fleece Jacket. Disclosure: Review product was provided to me free of charge, thanks to Tomoson.com. All opinions expressed are my own, and were not influenced in any way. Only 1 entry PER HOUSEHOLD. Be sure to leave your email address in each comment. This giveaway will end December 20th, 2010 at 11:59. I love their Pet Island bed. I follow Kakadu pet on Twitter as giveawaysetc. I voted for your rats. I love the Kakadu Pet Christina Hooded Sweat Suit. I like their adventure bed in midnight and mandarin. I would love the Kakadu Pet Oasis Pet Bed for my dog! Thanks for the review and giveaway. I love the clothes by new little guy needs a bed. I love this one! and would need a small and I love the dark navy color. He is trying to share the one with our other dog and she doens't love that at ALL! I voted for Lil Luis and Lana today! I follow Kakadu Pets on twitter! I LIKE Kakadu Pets on Facebook! I left a message on Kakadu Pets Facebook page that you sent me and entering here...actually I left two where your giveaway was posted there, cuz I left the first one before I knew this was one thing you asked for. Hope you can find them. I have request out for Facebook Friendship...I thought I had that before? sorry. I am a GF follower but am trying to sign back in for the day and keeps saying 'done'...so cant see my picture up? I do follow publicly. I voted for your babies tonight! Happy Saturday! I voted today! Oops...I deleted the above post as it was the tweet to have others vote for your bathtub pic, but I then see it was not a part of this giveaway. sorry to mess up your entry count Amanda! Voted today for Lil' Luis & Lana! I voted for Luis & Lana! I voted for Lil' Luis and Lana tonight! I would love to have the Kakadu Pet Cot! sorry Amanda thought I put in my vote link ...as I did vote and closed it out when I thought i had copy...sorry. Not a good night. I voted today 12/16...thank you! Just voted for Lil Luis & Lana! Just voted for Lil' Luis & Lana! I would love to have the Kakadu Pet Adventure Mat! I wrote on Kakadu Pet's facebook and told them I entered and you sent me! I follow you on GFC as crazylicious85 (GMAIL) / Allison L.
*forgot to include my email in my last comment/entry, but since i have link to facebook hopefully that works?! Just voted for Lil Luis N Lana! I also like the Kakadu Pet New York Pet Carrier! I voted for Lil Luis & Lana! I voted for your ratties in the photo contest! That jacket looks awesome! I would love to get one for my grey hound! She is always so cold in the winter, but she still needs her exercise! I wonder if I could find something like this in the pet accessories section of my local pet store?